Fans of Traditional Metal should beg, borrow or steal to get their hands on 'Will To Power'. 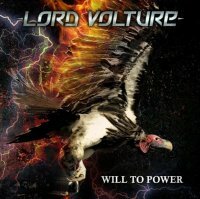 Fans of Traditional Metal should beg, borrow or steal to get their hands on 'Will To Power', the third album by Dutch band Lord Volture. Great songs, soaring vocals, galloping rhythms and guitar solos round every corner are to be found throughout the nine songs. The album kicks off with the no holds barred 'Where The Enemy Sleep' featuring the Halford-esque high-pitch vocals of lead singer David Marcelis. 'Taklamalan' keeps up the momentum; the twin guitar attack of Paul Marcelis and Burn axe-slinger Leon Hermans are phenomenal throughout and ably supported by the hard hitting rhythm section of Frank Wintermans on drums and Simon Guerts on bass. Highlight for me, and one of the Metal songs of the year, is the 'The Pugilist' with its punchy Saxon-inspired riff that will be going through your head for ages once heard. This song just keeps on giving as just when you think it's finished, the band weigh in with a plethora of blistering solos. The title track 'Will To Power' is inspired by German philosopher Friedrich Nietzsche and, thankfully, has nothing to do with the Miami dance act of the same name. The heaviest song on the album is the ferocious 'My Sworn Enemy' that precedes the epic 'The Great Blinding', a song that keeps gathering momentum throughout its course and includes multiple guitar solos, including ex-Megadeth guitarist Chris Poland. This is the third consecutive album that LV has included guest guitarists: their debut 'Beats Of Thunder' featured Annihilator's Jeff Waters and the sophomore 'Never Cry Wolf' Sean Peck of Cage. Kudos to the band, as this is simply not a gimmick and Poland adds that extra special dose of magic that helps raise this album to another level. Don't be fooled by the quiet intro to 'Omerta' (Italian for a family code of silence) as this song is anything but silent and screams out of the speakers. 'Badajoz (1812)' is another epic and recounts one of the bloodiest sieges of the Napoleonic Wars that resulted in the deaths of nearly nine thousand men; like the battle, LV takes no prisoners. The album concludes with the more straight forward Metal of 'Line 'Em Up!' featuring yet more scorching solos. Despite the album's ferocity, the excellent production, courtesy of Bart Hennephof and Yuma van Eekelen, mix by Stephen van Haestreght and mastering by Peer Rave makes '...Power' a very easy listen. Nietzsche believed "der Wille zur Macht" (Will To Power) to be the main driving force in humans: achievement, ambition and the striving to reach the highest possible position in life. Lord Voltaire have certainly done the latter with this album that sees them firmly in the Champions League of European Heavy Metal.